Closet rod failure? Too many clothes? New person coming into the household? Inefficient use of space? Is your closet in total chaos? 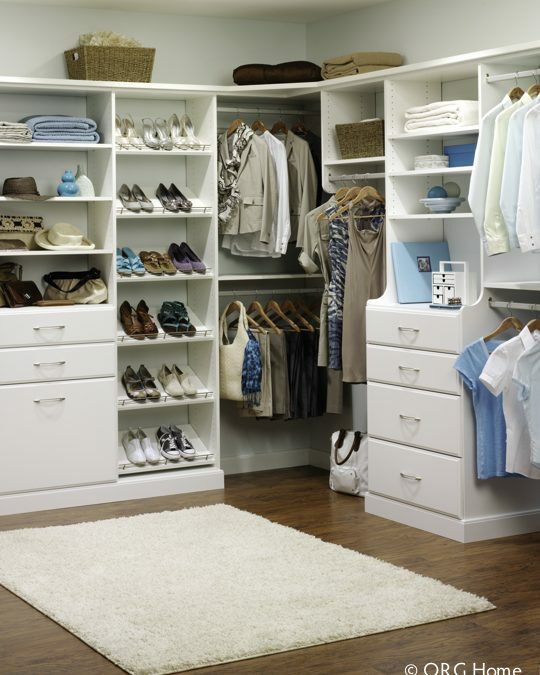 Whatever the reason, here are some tips to help you sort and efficiently organize your closet. To improve your closet, there are two things you must have. The first is an optimal storage option with hanging rods, shelves, and possibly drawers. 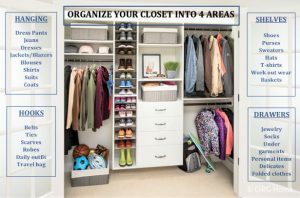 The second is making the most of every part of your closet to store your clothes and accessories. The ideas are limitless, but first you need to examine everything in your closet in order to understand what options will work best for your needs. Is it damaged or stained? How do I feel when I wear this item? Obviously, anything that is torn or permanently stained will be tossed in the trash. Any items still in good shape can be donated to many charitable agencies: Goodwill, St. Vincent De Paul, or work items can go to Dress for Success. Check your local listings for address and donation time. Hanging: Anything you want to hang up goes here. Make sure you have plenty of length for your dresses. Maximize the space with double hanging for shirts and jackets. Remember, a three foot double rod is six feet of total hanging space! Shelves: Shelves can hold almost anything. The trick is to keep everything in it’s place on the shelves. Storage baskets are a great addition and can hold purses, hat and linens. Consider dividers to keep sweaters neat and in place. Shoes will be up off the floor and easy to see. You can even use the shelves as a display for baseball caps or family photos. 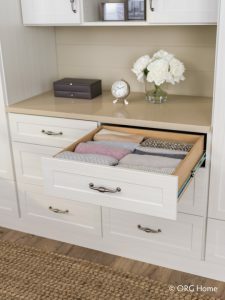 Drawers: Drawers are a great place to keep your personal items such as jewelry, undergarments, socks and folded items. Triple fold shirts and place sideways to fit more in the space. When you wash the item, place it in the back of the row to rotate your clothes. Use dividers for your socks and underwear. It’s easy to start your day with everything in one place. 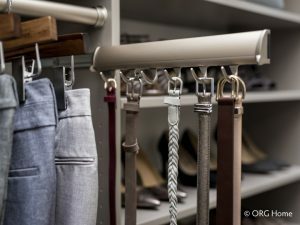 Hooks: Attach to the side of your closet system or put hooks on an otherwise unusable wall. Hang your robes on hooks, sort your ties, scarves and belts on pull out hooks. Choose your outfit for the day and hang it on a pull out valet rod. Going on a trip? Place your travel items on the valet rod so you can just dress and go! Label your baskets and bins so you know what’s inside. 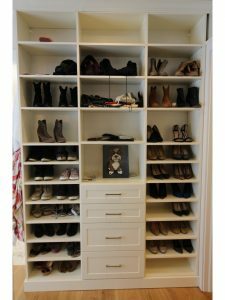 When returning your items to your closet, try to sort by seasons. At the end of each season, assess if you wore/used the item. If not, put it in the donate, sell or toss pile. Every time you purchase a new item, try to remove an older, no longer used item. Again, donate, sell or toss pile. If something is damaged, DON’T return it to your closet! Either keep a pile for repairs or toss it if it’s beyond help. Keep a mirror nearby so you can see how wonderful you look everyday!